This workshop has the fundamental aim of showcasing the spectacular progress in recent years in the studies of nonlinear diffusion equations as well as equations of geometric flows. We target to bring to the fore the key challenges for the future in quantitatively analysing the dynamics of solutions arising from the flows generated by deterministic, nondeterministic or geometric evolution equations. 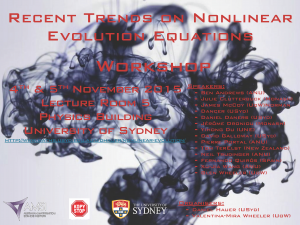 In particular, this event has the intention to give PhD students and early career researchers the opportunity to meet some of the leading experts in the field of geometric evolution equations and nonlinear evolution equations. Every interested researcher is invited to attend and participate at this event. This is a free workshop but please register if you would like to attend. The Conference Dinner is on Wednesday evening (3 November). If you want to attend the conference dinner, then please register for the dinner ($15 for Phd students and early career researchers, $30 for general participants). Registration for the workshop and the dinner can be done at Eventbrite.